Cumulation – Yarns and/or fabrics from one FTA partner country to be used in another FTA partner country and qualify for duty-free benefits (In NAFTA and the future TPP agreement, cumulation is among FTA partners only) . Example: in CAFTA certain woven fabrics from Mexico (NAFTA) can be used for the manufacture of apparel in the CAFTA region and qualify for CAFTA benefits, i.e. duty-free access to the U.S. market. Tariff Preference Level (TPL) – An exception to the rule of origin in FTAs that allows for a certain quantity of textile and apparel goods (usually yarns, fabrics and cut pieces) from a third-country (a country who is not a party to the agreement) to qualify for the FTA benefits. Example: Under the U.S.-Bahrain FTA, Bahrain can use up to 65 million sme of yarns and fabric from any other country and the products made from those yarns and fabrics (up to the 65 million limit) still qualify for duty-free access to the U.S. market. 807A: a commonly used term (formerly utilized by US Customs) to describe a category of apparel which has been assembled in an overseas country from fabric pieces cut and formed in the USA. The duty levied on apparel imported under 807A, a modification of 807, is based only on the value added to the goods overseas rather than the whole customs value of the goods. Also, goods imported under 807A are provided with almost unlimited access to the US market. This provision is specified under code 9802.00.8015 of the USA’s Harmonized Tariff Schedule (HTS). Short Supply/Commercial Availability — Fibers, yarns, and fabrics determined not to be available in commercial quantities in a timely manner from within the FTA partner countries may be sourced from outside the countries for use in qualifying textile and apparel products. For example, a fabric that is determined not to be commercially available under the U.S.-Australia FTA may come from a third-party, i.e. China, be cut-and-assembled into a garment in Australia, and imported to the U.S. duty-free. Square Meter Equivalents (SME) – A notional, common unit of quantity, constant across apparel categories. Conversion factors are used to convert units of quantity into SME. Common measurement used to determine specific quantities of yarns, fabric, and apparel allowed under exceptions to the rule of origin, i.e. TPLs, cumulation. 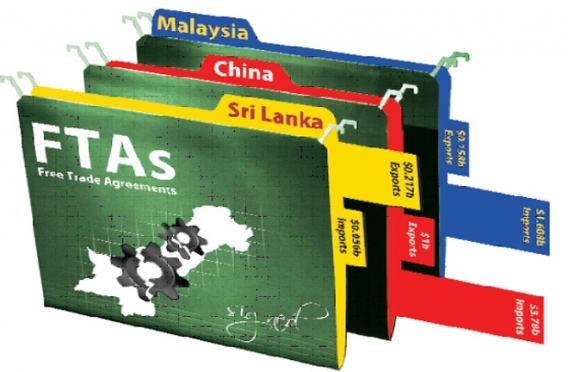 Third Country – A country outside of the FTA or preferential trade arrangement, but is not a party to the agreement and is not required to adhere to the rules of origin under the agreement but may supply inputs to the FTA countries. Earned Import Allowance Program (EIAP)– Certain amount of apparel assembled in a FTA partner using U.S. yarn and fabric will allow certain amount of apparel assembled in that country using third party yarn and fabric also to enter the U.S. duty free. For example, under CAFTA-DR, every two square meter equivalent (SME) of apparel assembled in Dominican Republic using U.S. yarn and fabric allows one SME of apparel assembled in Dominican Republic using third party yarn and fabric to enter the U.S. duty free. Wholly-Assembled – A good is wholly assembled if all of its components, of which there must be at least two, pre-existed in essentially the same condition as found in the finished good and were combined to form the finished good. For example, the sewing together of the sleeves and the body of a shirt would be considered to be wholly assembled. I found that reading this article helped me better understand some of the different terms used in the textile and apparel trading industry. Laying out the definitions like that straight forward, in black and white is easier for me to learn the information rather than be mixed in with my notes and during lecture. Im glad that I stumbled across this post. I feel more confident in knowing the term of trade! Thank you for posting this list! All of these terms have been used in reading material I have had throughout my four years, and although I have learned all these terms, it really helps to have this here where they are all in one place. It is a good reference list when I may forget a term or two. Thank you! Thank you so much for clarifying all of these definitions. Although they have been words or phrases I have heard over my years as a fashion student, teachers have taken little time to fully explain the definition of each term. Not only does this help me better understand everything we have learned in class so far but it will also help me to be more knowledgable in the future. Thank you! Thank you Dr. Lu for breaking down these key terms for us! It really helped me get a better understanding of each trade agreement term. It’s very rare for a teacher to be a dedicated as you are to help us better our understanding of the industry and it is extremely appreciated!